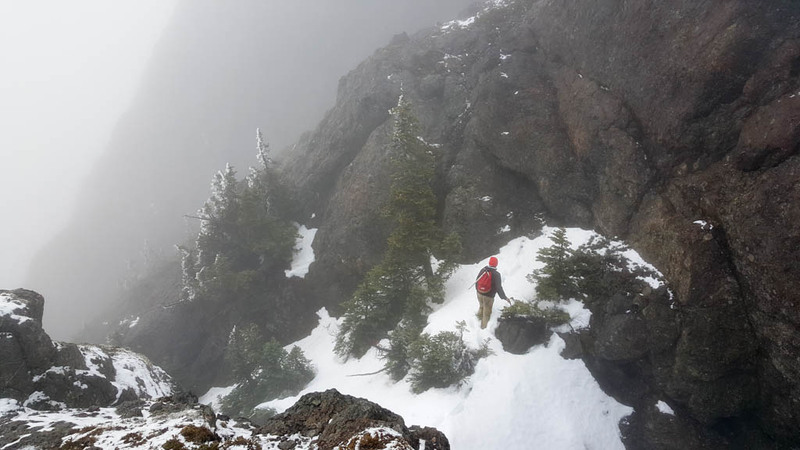 A year ago, I went on my first trip with Alpine Club on Mt. Arrowsmith. Many great trips later, things have come full circle with another trip up UnJudges. The weather this year made the conditions a bit more exciting. Here’s a photo from late October 2015 at the same elevation as the photo at the top of this blog post. We started out with blue skies and some clouds. After slogging through the steep trails, we earned our reward — a bit of a view. Having spotted some snow from the road, I was a eager to see the white fluffy stuff. But no signs of it yet. As we kept going, things became foggier and wetter. Last year, I remember this final approach to the south summit being relatively quick and straightforward. With slimy rock and slippery heather underfoot, it was remarkably more challenging. When we got to the south summit, we were finally rewarded with snow! After a quick lunch, we traversed along the ridge to the summit. How happy am I about snow? This happy. We finally made it to the summit at 1800 meters. It was very cold and windy to say the least. Without much delay, we headed back down the Judges route. And winter was gone as quickly as it had arrived. Several people on this trip were digging deep to challenge themselves physically … myself included. This was probably the most physically demanding trip I’ve undertaken since I injured my back 11 months ago. Others were experiencing conditions they hadn’t encountered before and learning new skills. This meant our large group was not winning any speed records. Combined with Daylight Savings Time just ending, we finished our trip by headlamp. Everyone got back safe and sound, with a quick stop for DQ on the way home. Another great adventure!